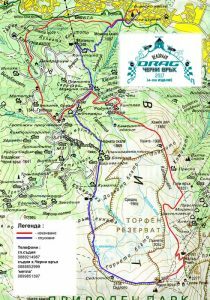 Drag Bicycles Велорали "Черни връх" | Уебсайт за събитието велорали "Черни връх"
For the 15 annual velo rally Drag – Cherni Vruh in the Cross Country discipline. Declaration of Participation – .doc (32KB) – Must be filled out by every participant when registering and paying the fee . The fee for taking part in the competition is 30 leva. You may register and pay your fee at the DragZone Bulgaria store in Sofia, Bulgaria Blvd., block 7А. You must also fill in and submit the ‘Declaration of Participation’ at the same time. Your race number will be handed to you when registering. You must have insurance for mountain sports. Last deadline for registering and paying the fee is 16:00 h on 19.09.201. After that the registration fee is 40 leva. – 7: 45 – 8:45 – Meeting point Boyansko Hanche. The race is organized according to the regulations of the World Bicycle Federation of Mountain Biking. Be equipped with a helmet and gloves. Sign the declaration attesting their good health and cycling skills. Participate with a properly functioning bicycle. Have adequate insurance /mountain insurance/. We recommend that every participant should have a cell phone with a fully charged battery in case of accidents. All participants under 16 years old must provide a written declaration from a parent /signed by the parent at registration or in front of the team leader /. Follow all traffic rules and regulations . Pass through every checkpoint (participant s who do not pass though all checkpoints will not have their time included in the rank ing and will lose the right to qualify). Ride only on the marked track. The participants must finish the race with the same bike that they have started with! If one category has less than 5 people the organizers reserve the right to include them in another group’s ranking. The ranking is separate for individual and team racers. All teams must pass the checkpoint with less than two minutes difference in the given time. If not the racers’ times will be considered only in the individual ranking. Deadline for registration is 16:00 h, 19 September 2018 .